As the name suggests, this Mong Kok market is famous for sneakers and footwear. However, shoes are far from the only thing on sale, with a wide variety of clothes, food and household items available. Most items of clothing are priced under HK$100.00. 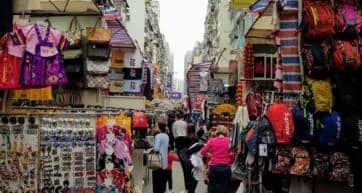 This market has less tourist appeal than Ladies Market, but with the target being thrifty Hong Kong locals, the prices are considerably lower.